Birmingham [U.K.): Heaping praises on Yuvraj Singh for his quick fire 53, skipper Virat Kohli on Monday described the Indian middle-order batsman's innings as "game changing", adding that the performance helped to "deflate" arch-rival Pakistan in India's opening Champions Trophy clash at Edgbaston here. "The way Yuvi batted, it was a game-changing innings and that gave all of us the confidence to start striking the ball well. Initially, the openers gave us a good start. It was a clinical performance from us and from the team's point of view, it is indeed a very big win," Kohli said. After Rohit Sharma departed at 93, India was 194/2 at the end of 36 overs. Despite notching up a 50, Kohli was finding it difficult to time the ball well. He admitted that Yuvraj helped him to take the pressure off him. "Later when I got to 50, I wasn't able to play freely and Yuvi came in and just took all the pressure off me. And the way he batted was the way only he can strike the ball - hitting low full tosses for fours and sixes, and even digging out yorkers for fours was outstanding. I think it really deflated the opposition and that gave me the time to settle in. I think his innings was the difference in the game," the Skipper said. 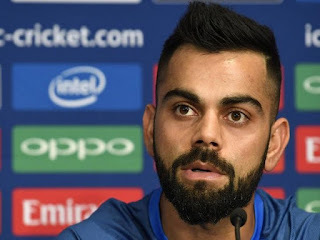 When asked about the inclusion of an extra seamer in the squad for Sunday's game, Kohli said, "We decided to play an extra seamer against Pakistan purely because of the fact that it becomes a wicket taking option. Throughout the innings if you hit your areas well in a place like England, the fast bowlers always come in to play with wickets precisely. Only because of the opposition, we went in with that combination." Defending Rohit Sharma for his slow paced innings, Kolhi said, "Rohit was taking a bit of time, understandably so, because he was coming to international cricket after a long time. The IPL is different, and international runs are different against a quality bowling attack as well." "So great thing that he took his time and played a long innings. Shikhar really batted well on the other end, so from that regard I think both of them started well," he added. Yuvraj's innings helped India to put up a target of 319/3, which eventually turned out to be too big a total for the Men in Green. His innings subsequently helped India to thrash Pakistan by 124 runs, as the score was revised by the Duckworth Lewis method after the match was delayed twice by intermittent drizzle.